Our U-Pack containers arrived on Thursday, August 21. We loaded them Friday through Monday, they departed on Wednesday, August 27. If your loading phase crosses a weekend you get 5 days to load. That’s enough time to consolidate and reconsolidate as you fill the cubes, and to make final decisions about what to take or toss as you go along. I’ve always enjoyed the challenge of packing things into containers. It’s kind of like building a stone wall. You wind up with oddly-shaped spaces to fill, and you look for oddly-shaped things that will fill them. In our case we had more odd shapes than normal. Luann collects, among other things, antique wooden boxes that she uses to frame her sculptures and jewelry. On the first iteration I nested them into one another and consolidated them into standard 6 cu ft boxes. The advantage of standard-size boxes is that you can pack them tightly into a container. But if there’s a lot of air inside those boxes you lose many precious cubic feet. So we unbundled the boxes and began using them, instead of standard small (1.5 cu ft) or medium (3 cu ft) cardboard boxes, for all the loose stuff that wasn’t packed tightly in the drawers of Luann’s various cabinets of wonders. As we filled the wooden boxes we wrapped them with mover’s wrap. That stuff was incredibly useful! It comes in 20″ by 1000′ rolls, it’s cheap, and it’s wonderfully designed for the purpose. The plastic doesn’t shrink-wrap but it’s tough and sticks to itself. We must have wrapped more than a hundred boxes. As a bonus you can see into the boxes so there’s less need to label the contents. Packing boxes of different sizes and shapes is like a game of Tetris, but in 3D and with irregular shapes. You pack as tightly as you can, but there will be gaps. Fortunately Luann’s studio offered another useful resource: collections of yarn and fabric. These were originally packed in plastic totes. But totes aren’t space-efficient so we tossed them, redistributed the contents into plastic bags of various shapes and sizes, and evacuated as much air from the bags as we could. The result was a supply of packing material to fill spaces and cushion the load. For the studio containers, in particular, we wound up using very few cardboard boxes. An unanticipated benefit of the wooden boxes: structural support. When you’re stacking into an 8-foot-high space cardboard boxes tend to crush, wooden ones don’t. In the end we used all four of the containers I’d reserved. Containers #1 and #2 are now storing Luann’s studio, #3 and #4 are storing our household stuff. If we’d been really brutal about excluding furniture we could have used only three and returned the fourth unused at no charge. I liked the idea of starting from scratch with nothing but a table and the bed we bought last year. But it the end a sofa, some chairs, and a few other items came along for the ride. The household containers held no surprises for U-Pack. But the studio containers, especially #1, raised an eyebrow. There are some heavy items in that load. 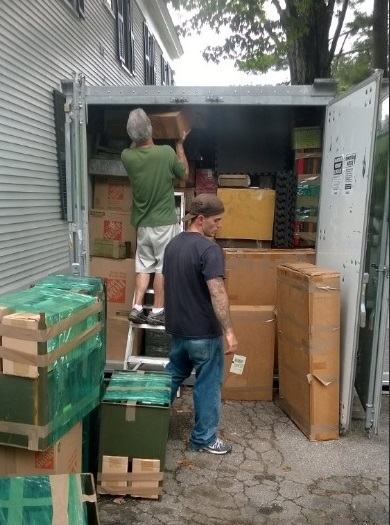 So heavy that I wound up hiring Dave Gillerlain and his team at Affordable Movers to help me load containers #1 and #2. What weighs so much? Among other things, African trade beads. Luann’s been collecting them for a long time, and she put Keene on the map of places that traders visit. A couple of times a year, Ibrahim Kabba would show up in his van and stage a bead show in our house. The van always rode low, and Kabba wore a back brace to carry in his wares. A cabinet packed full of those beads is a surprisingly dense and heavy object. I’d wanted Dave to distribute the heaviest cabinets between containers #1 and #2, but things went quickly and by the time we got to this point I realized #1 was going to be a beast to lift. A useful refinement for U-Pack would be to embed a scale in each container. That feedback would have helped us balance the studio load between #1 and #2. We’d left the house by Wednesday morning when the truck showed up to fetch the containers. But I dropped by for a final check, just in time for the pickup. It was the same portly middle-aged guy who had delivered the empties. One person can do the job, but that person is heavily augmented with some serious exoskeletons. This time, I was relieved to see, the forklift was much beefier than the one that had unloaded the empties. Still, I was worried about #1. Sure enough, he’d gotten #2, #3, #4 loaded, had struggled with #1, and was about to reposition the forklift for a second try. “What’s in that one?” I explained as best I could, and asked if it’d be OK. “Yep, just need to come at it from another angle.” He was cheerful, like every U-Pack person I’ve talked to, but despite his optimism I couldn’t bear to watch and drove away. Nobody called from U-Pack, and an hour later the truck and all four cubes were gone. We left Keene a week after the closing, on September 3, drove across the country visiting friends and family along the way, arrived in Santa Rosa on the evening of the 13th, and rented our new home yesterday, the 15th. It’ll be another week before we can move in, but it’s worth the wait. The place we’ve rented has enough space to unload everything and create a basic working studio for Luann. So we’ll be able to retrieve all four containers and end all the storage charges. But that’s an unexpectedly good outcome. This is the North Bay, space is at a premium, and the rental market is tight as a drum. We were prepared to rent a small apartment, retrieve only the two household containers, then later rent a separate studio and retrieve the two studio containers. Shipping a load to two unknown destinations, for retrieval on two unknown dates, with pay-as-you-use storage for each part of the load, was a tricky set of requirements. U-Pack has designed a really smart system that can, perhaps uniquely, meet those requirements. Excellent documentation and detail as always Jon. Love that you’re getting a big change of scenery. I’ve stayed in Santa Rosa for after conference visits in California (At Sonoma State, just south of Santa Rosa in Rohnert Park). If I was to move to California, that’s where I would have moved to as well. Next Next post: 3D Elastic Storage, part 3: Five stars to U-Pack!